Have you ever wondered about the new Chevrolet Avalanche's features, specs and more?Find out below! Don't stress out over your next purchase; look to the well-known Chevrolet dealership in Phoenix for thoroughly researched reviews written by industry specialists. To make educated decisions when it comes to your next Chevrolet Avalanche purchase, don't guess! Each passage is jammed with material and Avalanche features in way that's easy to understand. 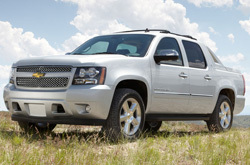 Read on, but don't hesitiate to contact Midway Chevrolet for more Avalanche information. Check out the 2013 Chevrolet Avalanche head-to-head with versus similar autos like the 2013 Ford F-150, Nissan Titan and the Cadillac Escalade EXT, and you will discover that the 2013 Avalanche beats out those vehicles in various areas. Pay attention to the reasons see why! Midway Chevrolet auto repair service in Phoenix is only a click away! Your Chevrolet deserves to be treated correctly - that means Chevrolet factory- trained technicians, real 2013 Chevrolet Avalanche parts, and the bliss that comes from a 12-month service work warranty. Midway Chevrolet's auto service associates will help keep your Chevrolet Avalanche in muscular shape. Whether you need us to administer a easy situation as an oil change, or take on more complicated Chevrolet service and repairs like transmission rebuilds, strut and shock repairs, timing belt replacements. Midway Chevrolet is your number-one choice in Phoenix for fast, professional Chevrolet Avalanche repairs and regularly scheduled maintenance. Click the next link to be lead to to Midway Chevrolet's service coupons.